Ovarian cancer tends to come back. We knew this. But we thought it might come back years later. YEARS later. When ovarian cancer comes back within the first six months after treatment, it's worse. It means that it is not cured, won't be cured, can't be cured. It means it's resistant to the main agent used to fight it, which is platinum. Cancer that returns within the first six months is considered platinum-resistant. Throwing more platinum at it won't work very well, and is toxic to the body anyway. The doctor figures Amanda has another year, maybe two, left to live. That was a pretty awful time. That diagnosis led us to sell our home, leave our friends, and move half-way across the country to be near family in Amanda's last days. But a year later -- she's still here. I'm so glad. This called for a celebration. Everything from here on is bonus time, right? We invited the extended family over for snacks and cake, then we went out to dinner at The Tasting Room in London for what might've been the most expensive dinner for two we've ever had. It was really good. To update my previous post, I can report that Amanda is impressed with life without the ureteral stent. No more internal poking, no more internal bladder-scraping. Plus she's been able to stop taking the pee-less-frequently pill that had dried her right out. The docs in London also prescribed her a different kind of painkiller for her post-chemotherapy joint pain, and after investigating some pretty scary-sounding potentially fatal possible interactions with her other meds, she tried it. First shot was great. Mixed results since, but it's great to see her mostly pain-free once in a while! We finished watching Breaking Bad. Wow, that was a good show. What's next? I haven't checked the calendar, but I suspect there's another scan coming up soon. I know that brings a lot of anxiety with it, but the past two have been encouraging. I'll keep you up to date. I never know what to say. I'm just so glad she's there with you. 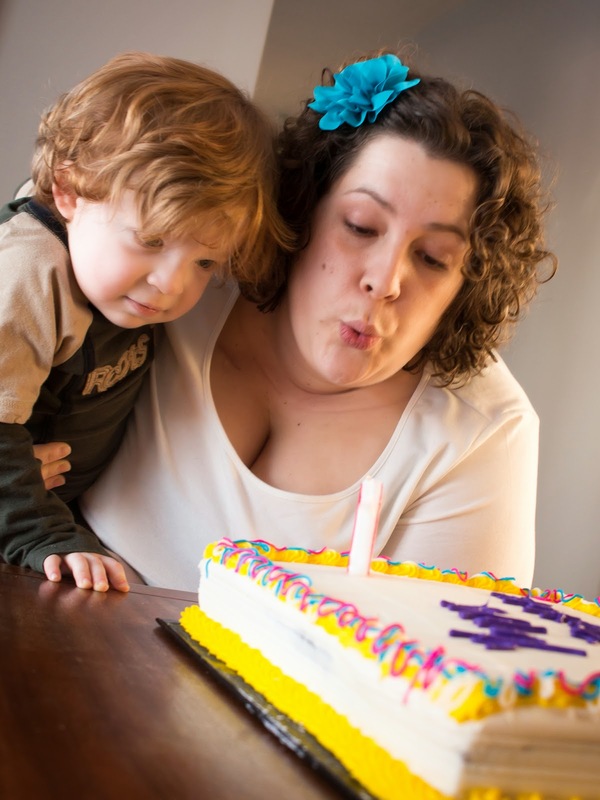 That photo of your wife and son with the cake is stunning—they're both gorgeous. Wishing you many more cakes. --A Reader. Looking great you two. Hoping for another encouraging report soon.